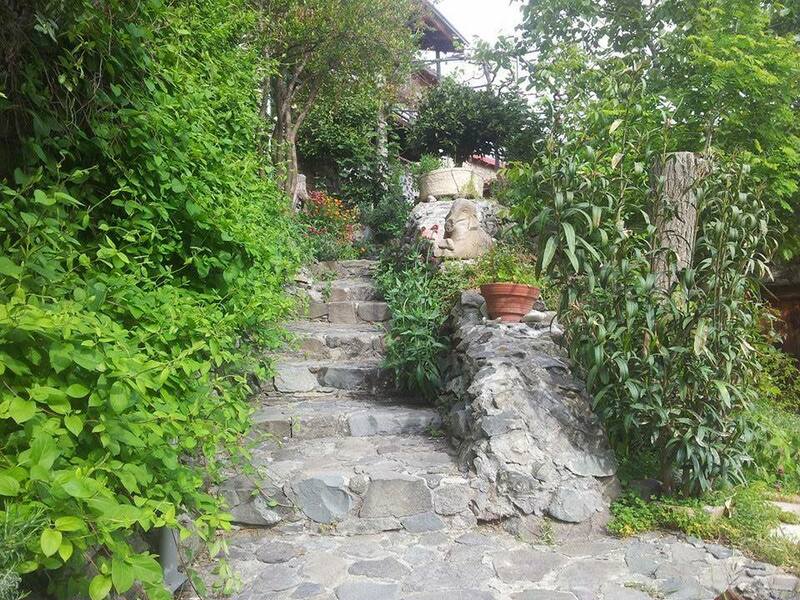 Ecovillage Tris Elies – Life in Harmony – Discover our project, our latest news, and our vision for a sustainable future. Discover our project, our latest news, and our vision for a sustainable future. 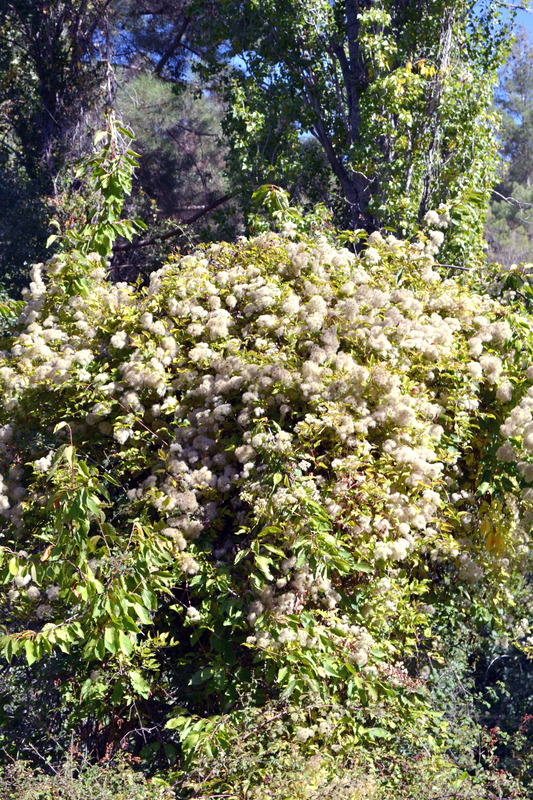 Perhaps like many of you reading this articles, I myself, not too long ago had no idea which tree blossoms first in the mountainous regions of Cyprus. I remember last year watching these amazing trees blossoms in winter (February) to my great surprise. I quickly asked whoever was with me to tell me what tree this is that blossoms so early and so beautifully! Which tree is it? The Almond tree! Almonds are an incredibly popular tree nut. Despite being high in fat, they are highly nutritious and extremely healthy. A clinical trial of 60 male smokers found that 84 grams (about 3 ounces) of almonds per day reduced oxidative stress biomarkers by 23-34%, over a 4 week period. These findings support those of another study, which found that eating almonds with main meals reduced some markers of oxidative damage. Several studies have linked higher vitamin E intake with lower rates of heart disease, cancer and Alzheimer’s disease. This makes them a perfect choice for diabetics. Magnesium is a mineral involved in more than 300 bodily processes, including blood sugar control. The current recommended intake for magnesium is 310-420 mg. Two ounces of almonds provide almost half of that, with 150 mg of this important mineral. It turns out that 25-38% of type 2 diabetics are deficient in magnesium, and correcting the deficiency significantly lowers blood sugar levels and improves the function of insulin. Interestingly, people without diabetes also see major reductions in insulin resistance when supplementing with magnesium. This indicates that high magnesium foods (like almonds) may be beneficial for prevention of metabolic syndrome and type 2 diabetes, both of which are massive health problems today. High blood pressure (hypertension) is one of the leading drivers of heart attacks, strokes and kidney failure. A deficiency in magnesium is strongly linked to blood pressure problems, regardless of whether you are overweight or not. Studies have shown that correcting a magnesium deficiency can lead to major reductions in blood pressure. What you eat can have major effects on LDL levels, and some studies have shown almonds to be effective. A 16-week study in 65 pre-diabetic subjects found that a diet with 20% of calories from almonds lowered LDL cholesterol levels by an average of 12.4 mg/dL. Another study found that 1.5 ounces (42 grams) of almonds per day lowered LDL cholesterol by 5.3 mg/dL, while maintaining the “good” HDL cholesterol. The almond group also lost belly fat. They also protect the LDL from oxidation, which is a crucial step in the heart disease process. The effect may be even stronger when combined with other antioxidants, like vitamin E.
In one human study, snacking on almonds for one month lowered oxidized LDL cholesterol levels by 14%. Both protein and fiber are known to increase satiety. They help people feel more full, so they end up eating fewer calories. In a 4-week study with 137 participants, a daily 1.5 ounce (43 grams) serving of almonds significantly reduced hunger and desire to eat. Numerous other studies support the hunger-fighting effects of nuts. Bottom Line: Nuts like almonds are low in carbs, but high in protein and fiber. Studies show that eating almonds (and other nuts) can increase satiety and help you eat fewer calories. About 10-15% of the calories in nuts aren’t absorbed, and there is some evidence that eating nuts can boost metabolism slightly. Combined with the hunger-fighting properties, it makes sense that nuts are a great addition to an effective weight loss diet. Interestingly, there are some quality human studies that support this. In one of them, a low-calorie diet with 3 ounces (84 grams) of almonds increased weight loss by 62% compared to a diet enriched with complex carbohydrates. Another study in 100 overweight women found that those consuming almonds lost more weight than those in the nut-free group. They also had improvements in waist circumference and other health markers. How to build a 4m * 12m €300 hoophouse greenhouse! Before i star this post, I would like to send out a big thank you to Vasili from Farm Fresh https://www.facebook.com/Farm-Fresh-Eco-Organic-Farming-Platres-794658383916308/?ref=ts&fref=ts . Vasili was the initial push to me to get my greenhouse going! 3. Here you can see that I used a 3/4 inch galvanized pipe which was a standard 6m long. I cut it into bits that are 50cm long and hammered them into the ground. Then I inserted the 1/2 inch hoop pipes inside and attached them together with the screws that you can see in the images below. The type of screws used have a smooth outer surface so as not to rip the plastic. 5. Once the structure is up, then it is time to place the plastic. The plastic if possible order it to be larger than the size of the hoop house so that we can use soil to weigh it down into place as shown in the images below. So stay tuned with us on how we do the door for the greenhouse and what plan we chose on how we will be growing inside the greenhouse. Will we add compost heaps and chickens to provide heat? Shall we implement high maintenance grow beds? Ground cover and natural farming? Who knows…. for now we are happy that we have the greenhouse in place. We greatly look forward to utilizing this structure in any way we can! For any question you may have about this greenhouse hoop house please do no hesitate to contact us! Do not worry, this is not a post trying to teach you how to make the perfect compost just yet! I myself do not have the experience yet to be able to say i know what i am doing. So in Situations like these, a tactic i follow sometimes is doing a bit of everything! So today i would like to share some pictures about some of the composting methods me and the rest of us that live here are doing/trying out. Worms are great friends to have near the house. A worm compost can be set up very near (even on balconies if you live in flats) your kitchen in a container as shown below. If you use cardboard with damp clothes on top of the cardboard to cover the worm compost, there will be no smell and it will not become a breeding ground for fruit flies. A great way to cut down on the extra emissions needed to transport food waste out of towns, is worm composting. Once you learn what to put in and what not to put in, ie worms do not like citrus peals, it is a very simple process. Worms are very resilient also, last year I forgot them outside and the temperature dropped to -7C and they survived! This composting bin was a present from our great friends over at Riverland! You may notice on the bottom right of the picture a tube sticking out the side of the bin. This tube goes right through the bin and has lots of holes in it. This is to allow air to enter inside the bin to avoid anaerobic composition. Temperatures can rise quickly inside one of these, specially when left in the sun. It is best to have a compost thermometer to measure the temperature at the core of the compost and if that temperature is above 60C, it’s time to turn! I would say the chickens are the most entertaining method of composting out of all, and maybe the fastest too. The excitement they have when they see someone pour a bucket of old food scraps into their composting area is great. It even gets me excited a bit too! We still have plenty more to learn about composting and bettering our soil quality. We have our little experiments running and we are very excited to see the results and learn. Perhaps composting could help heal this planet faster, after all a planet with fertile soil is a healthy planet. Finally our village has some interesting additions to it! Using the re-use, re-think and recycle philosophy, the wood was 100% recycled. As you can see above and below is the back and the front side of our new welcoming sign on the way toward Lemithou. Also we added a couple benches. And my favorite of them all, the beautiful pots! The Artists were Fatima and Kitti. Thank you for the Artwork girls! 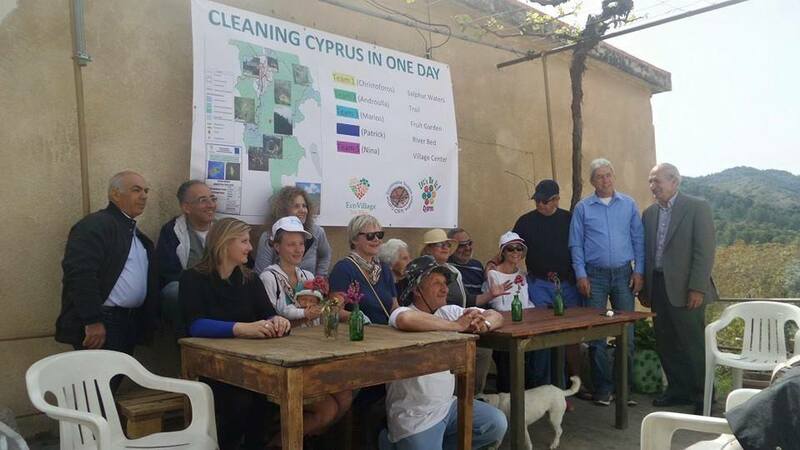 This effort was a fantastic coordination between the Cyprus tourism organization and the Ecovillage team. The CTO put forward the funds and the Ecovillage gave the opportunity to its new residents to make the items. 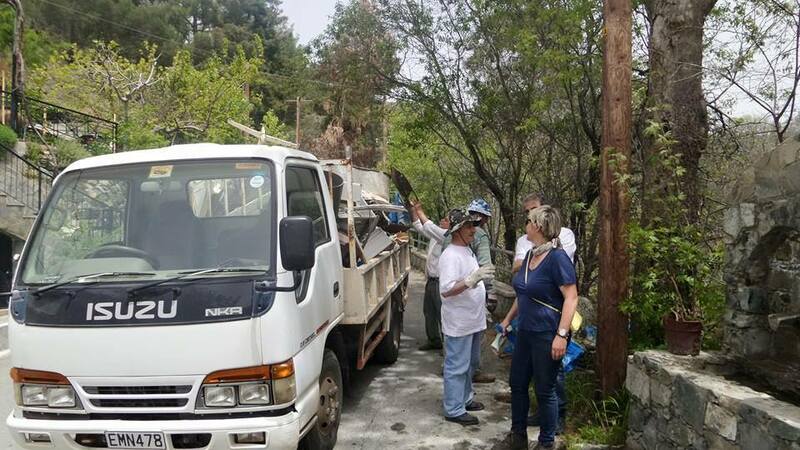 Not only do such efforts add to the beauty of the village and make a smart use of recycled wood, but they also help the new residents of the village with job opportunities! We would like to thank the CTO for being so kind to us. We would also like to thank everyone from the Ecovillage that helped make this effort a reality. There are also a few more items made out of pallet wood to be added in the near future also! (Bins, more pots, more benches, some information signs and more welcoming signs for the other roads leading into Tris Elies). The pomegranate is a magical fruit. Originating in the high steppes of Iran, it traveled westward along the Silk Road with traders or quite possible with Alexander the Great and his team of botanists. Who can argue with those who claim that it was in fact the sensuous pomegranate (or seeded apple) that seduced Eve? We have plenty of pomegranates here in Treis Elies and this is the season for eating the last of them. Some Cypriots will keep pomegranates well into the spring by stuffing them in pantyhose and hanging them in a cool, dark place. These pomegranates are then used as needed for kollyva, the mixture of almonds, wheat berries, raisins and pomegranate seeds served at funerals and memorial services in honor of the deceased. Pomegranates are admittedly difficult to peel, but once you get to the ruby seeds they are not only delicious but also incredibly healthy. You can eat them with a spoon, toss them in a salad with some strong flavored salad green like rocket, or juice them. You can even preserve the juice by cooking it down to make pomegranate molasses, a common ingredient in Middle Eastern cooking. Knowing that the skins are highly tannic and have been used in natural dyeing, I recently threw some in a pot and cooked them for a few hours. They yielded a rich yellow color, perfectly in harmony with the autumnal landscape. Adding a mordant like alum powder to the mix I assume will make these colorfast, but for this purpose I didn’t bother. Here are some strips of wool drying, to be used in a braided rug. Not bad and completely natural! 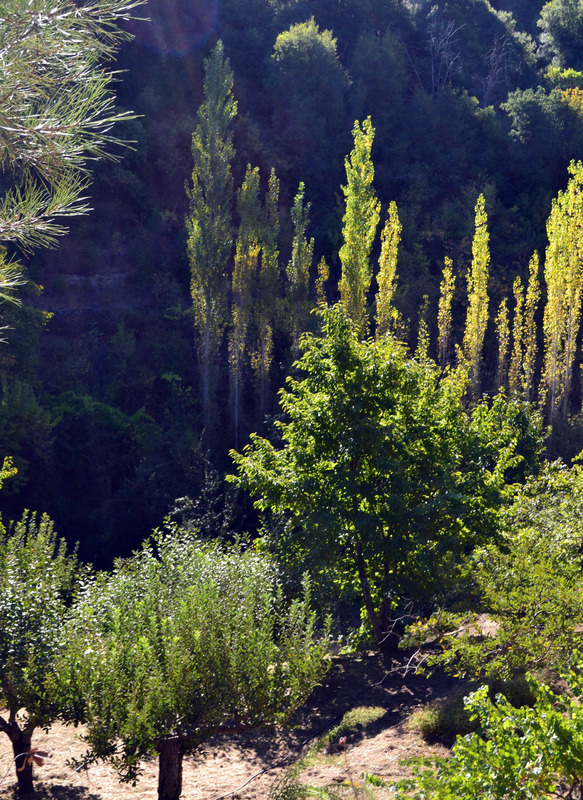 Treis Elies is a small village, tucked into the slopes of southern Marathasa, where the Troodos forest borders the Paphos forest. 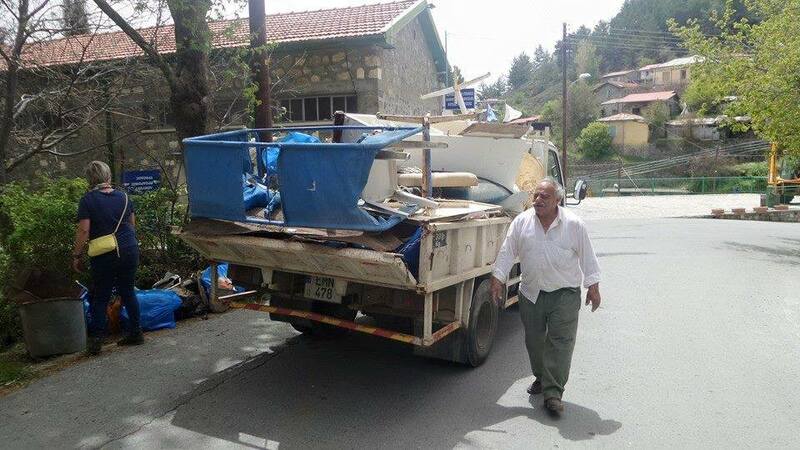 Many Cypriots have never heard of it. It’s not conveniently close to cities, nor does it boast many meticulously restored stone houses and quaint squares. It’s rather remote, a few winding streets carved into the hillside with houses with the mostly metal roofs characteristic of villages where snowfall occurs. The houses, along with a handful of churches, some kafeneia and an inn, spread upward from the Dragon river, a tributary of Diarizos, and its narrow valley. It is this valley of striking fecundity that sets the village apart. Here, every fruit tree with the exception of citrus and other cold sensitive tropical imports, blossoms and sets fruit at an impressive pace. 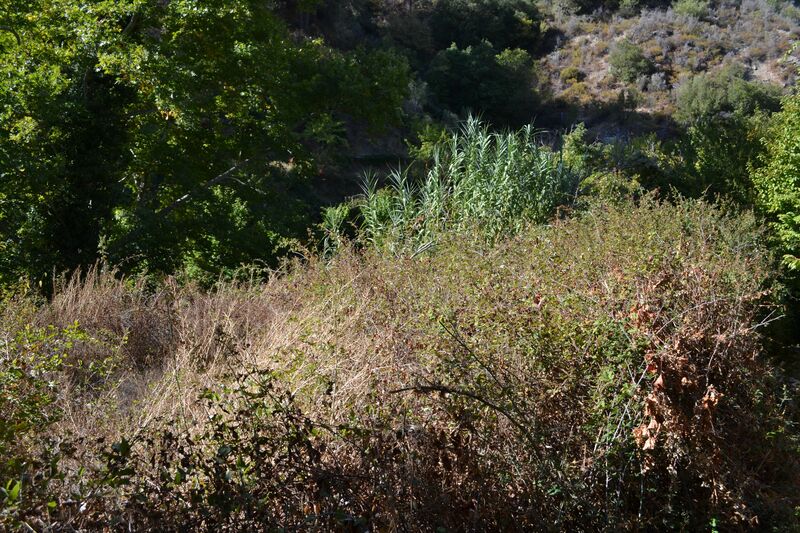 Walking along this valley you will find a mosaic of half-hidden orchards, many with their own microclimate. 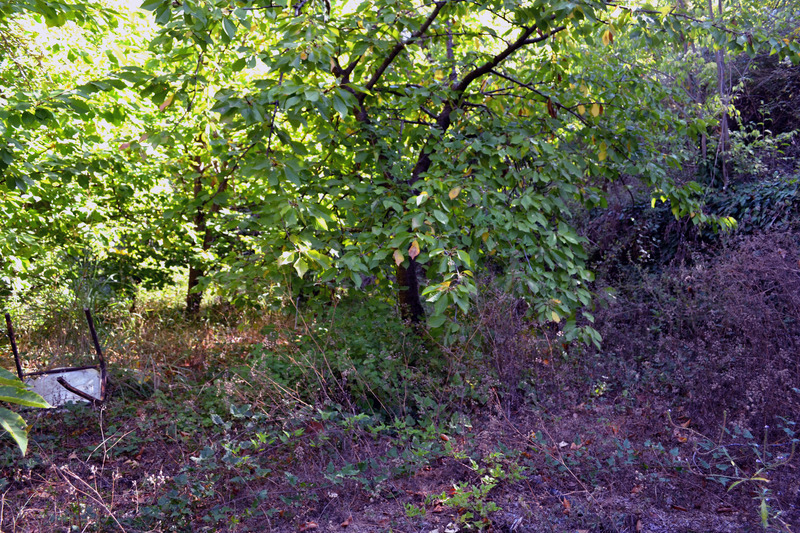 Dappled light shines onto cherry, walnut, plum, apple and quince trees, trellised kiwis and grapes. In between these little gardens of Eden, pockets of pine and golden oak forest are surrounded by rock rose and other fragrant bushes typical of the mediterranean garrigue. On the wetter lower tiers, there are towering oriental planes, poplars and alders, and the occasional majestic aleppo oak. Look down and you’ll see a thick understory of endemic wild mint, ferns, and lemon balm. But a thicket of wild berry brambles renders many fields and orchards impenetrable, and white fuzzy clouds of clematis swallow up entire trees. Many trees are in desperate need of pruning. In late summer, bees, birds and flies buzz around, getting drunk off rotting figs and plums. 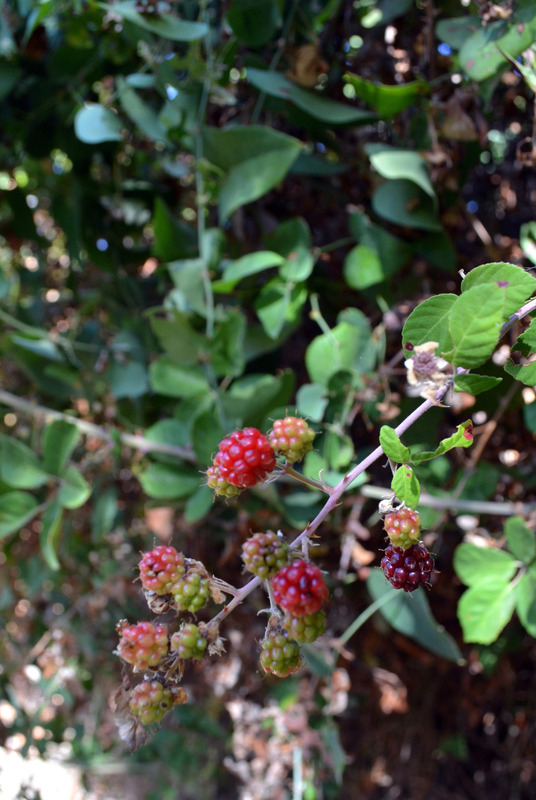 As in most of rural Cyprus, there are more trees than there are hands to tend to them, more fruits than there are hands to pick them. Urbanization and the ensuing aging of the rural polulation has rendered a way of life which was reliant on the land obsolete and made the land revert to an almost primordial state. To be abandoned by people has served this natural ecosystem well. This is a place brimming with life-there is an impressive diversity of wild plants, along with birds like chickadees, jays, and blackcaps, lots of insects and even some roaming moufflon. There is also fairly clean water and rich soil. Compare this with those areas closer to the cities, where agricultural land was swallowed up by suburban sprawl and where topsoil simply disappeared along with people’s willingness to see anything more than monetary gain in a plot of land. Treis Elies however is also a village, and village means people. Can this not be a place where nature is served right by people? Can we not use these resources-the abundant water, the beautiful dark soil and the moderate climate- responsibly, sharing them with all the creatures, human or not, that live here? Can we not maintain the land, putting back as much as we take from it, in order to reap both pleasure and sustenance for generations to come? Let’s hope that we reach these goals, seemingly so simple but requiring hard work and complex decision making. And let’s hope that the countless other forgotten corners of rural Cyprus, each with its own possibilities, challenges and gifts, are also revived. 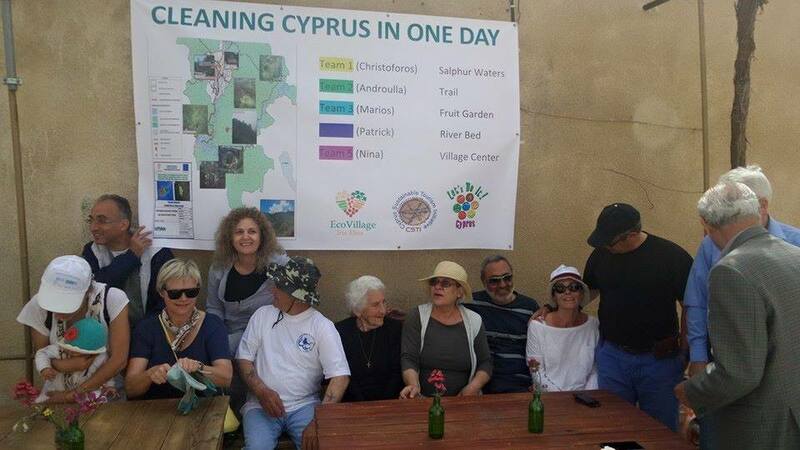 Recently, our ecovillage took part in an island-wide event, “Cleaning Cyprus in one day”, which was aimed, on one hand, at cleaning the island, and on the other hand, most importantly, at raising awareness on environmental issues caused by the unconscious management of garbage. 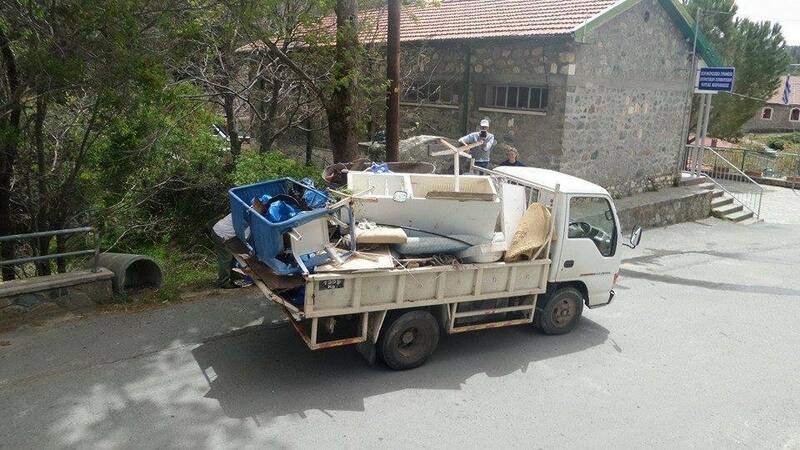 The event was a big turn-out, and we are happy to say that the village is now clean and good to go! Check the pictures below, and a big thank you to all the lovely participants! Welcome to the Tris Elies Ecovillage website. Here, you will be able to learn about our vision, the projects we are working on at the moment as well as our ambitions. You will also have the opportunity to learn more about the upcoming events taking place in our beautiful village, an feedbacks on those which happened already! We wish you a great experience on our site!